RANGOON – For foreigners edging sweatily along Rangoon’s humid streets, “change money?” is a common refrain around tourist attractions and hotels, where local black-market money changers compete to offer bank-beating rates of exchange to dollar-carrying visitors. But with ATMs being installed across the city, including some that accept Visa and MasterCard, foreigners are no longer completely reliant on the often troublesome need to procure enough pristine new US dollar bills before their trip, for exchange to Burma’s kyat after landing in Rangoon. Harun, who would not divulge his full name, is a money changer working the streets near Rangoon’s Sule Pagoda, one of the estimated 100 to 200 black-market dealers who make a living changing dollars to kyat. “Yes, business has gone down, but we’re not sure yet if that’s because of the ATMs,” he says. Right now, in the middle of the wet season, tourist numbers are down from their usual dry season peak, so it is still difficult for money changers to assess the impact of credit card-friendly ATMs—still just half a year old in Burma—on the tourist dollar-for-kyat exchange trade. Visa says cards can be used at “over 150” ATMs in Burma, with more than 200 point-of-sale (POS) locations across the country in shops, restaurants and hotels. MasterCard users can avail themselves of 140 ATMs in Burma and 72 POS acceptance terminals in Rangoon and Naypyidaw. “Visa has most recently announced the continued momentum of its payment network expansion in Myanmar with Co-operative Bank (CB), Kanbawza Bank (KBZ) and Myanma Apex Bank (MAB) to further enable point-of-sale (POS) acceptance for Visa payment cards,” a company spokesperson told The Irrawaddy by email. Esther March and Jaume Pedros, two newly arrived visitors from Barcelona, say they knew before their trip that it would be possible to use their credit cards in Burma. But, given that these facilities are new, they nonetheless brought dollars for exchange—money they plan to swap inside one of Rangoon’s banks, rather than on the street. “It was not clear to us how many ATMs there are and how reliable they can be,” says March. In Rangoon, ATMs are still scattered, as are POS locations in shops and restaurants where credit cards can be used, so tourists might face a couple miles’ walk or a taxi ride to the nearest one—assuming they know where it is. Seeking assistance from a hotel concierge—a usual compass-beating orientation routine for befuddled tourists—might not help, either. Asked if they knew where to find the nearest credit card-friendly ATM, staff members at the nearby Traders and Central hotels advised The Irrawaddy to try some of Rangoon’s big shopping malls, such as Junction Mawtin or Yuzana Plaza, although there is an ATM less than a five-minute walk from both hotels. There, Albert Aung is manager of the CB Bank branch, close to Sule Pagoda and Rangoon’s City Hall. He says his usual money-changing business has not yet been affected by the ATM on the wall outside, one of the few locations across the city where a Visa card can be used to withdraw cash. Another reason the branch’s exchange business is holding, for now, is the ongoing fall in value of the kyat, which seems yet to find its optimum market value amid Burma’s ongoing economic reforms and uptick in foreign investment. “The rate has become more or less the black-market rate, or, as we call it nowadays, the ‘informal’ rate,” says Than Lwin, deputy director of KBZ Bank, which has 55 ATMs across Burma. For Albert Aung, the kyat’s slide – it has lost 18 per cent of its value agains the dollar since being floated in April 2012 – means he is mostly just changing small amounts of dollars these days, as the greenback strengthens against the Burmese currency. “People are keeping dollars, waiting for the best time to change,” he says, with the black-market traders watching the bank’s rates to see if they can offer a better deal. Outside the branch, the street-walking money-changers linger, whispering the “change money” mantra to the occasional foreigner stopping to withdraw kyat at the CB ATM. Woo Young-Seok, a Korean businessman now based in Rangoon, says that although the bank system in Burma is “getting better,” it is still not up to scratch for foreigners trying to live and work in the country’s newly opening economy. And while Burmese citizens still cannot get a credit card from a local bank, the nascent modernization of Burma’s banking and payments regime is proving a boon to Burmese businesses that depend on foreign customers. Lynn Zaw Wai Mang is executive director of Unique Asia Travel and Tours, and a repository of horror stories about tourists visiting Burma in the pre-ATM era. “I met so many in my office here who came with dollars but ran out of money before their holiday was over,” he says. Now that foreigners can use credit cards at ATMs, Lynn Zaw Wai Mang says his business is slowly growing as a consequence. “If they know they can withdraw money here, then they will spend more for a bus ticket, flight ticket or hotel,” he says. But another money changer, San Win—who estimates tthat here about 150 others doing the same work these days in Rangoon—believes that in two to three years the illicit money exchange market will fade away as Burma’s wider economy modernizes. “I think once they [the Burmese government] bring in the new central bank law, the situation for the black market will change,” he says. A new central bank law is one of several economic and financial reforms expected to be introduced in Burma over the coming months. 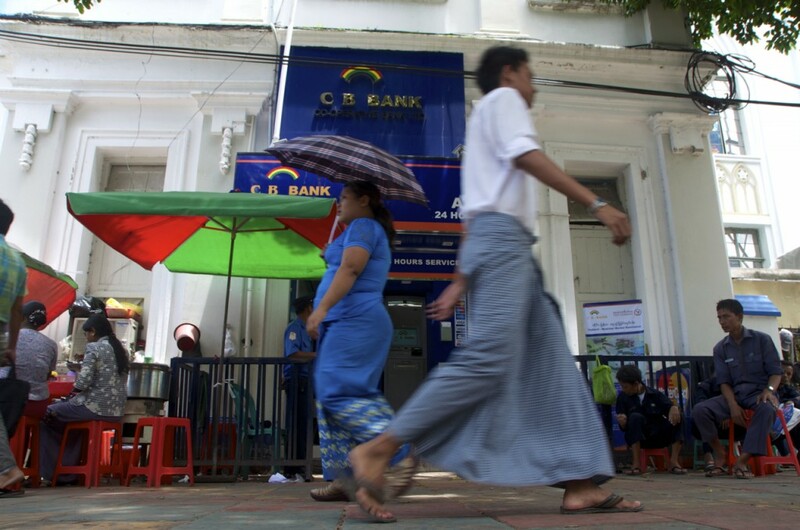 Than Lwin believes the black market—or informal market, as he prefers to call it now—will continue to play a role as Burma slowly develops more modern banking and financial systems. Nonetheless, some of Burma’s money changers are hedging against a shift away from the informal money market, and looking ahead to what the country’s upcoming economic reforms might bring.